How then will the occupation end? Members of Taiwan’s ruling Nationalist Party, which has a majority in parliament, are talking to their main opposition on how to ratify the trade pact. MPs are open to an item-by-item review, the cancellation of which incited a break-in that got the occupation started. That review could strike clauses hurtful to Taiwanese businesses, sending the agreement back to negotiators from Taipei and Beijing for another round of talks. The pact as signed in June would open 80 service sector categories in China and just 64 here – part of Beijing’s image management offensive aimed at political reunification with Taiwan someday. A vote on the trade agreement would need a podium clear of protesters. Groups who back the trade agreement despite fears of getting too cozy with old enemy China have threatened a showdown today with students in parliament. 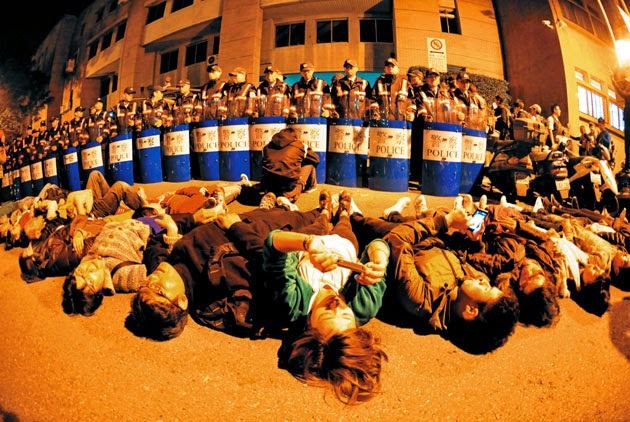 Taiwan’s president told a visiting US scholar Monday that the occupation is illegal and uncool in a democratic society. These pressures would prompt legislative speaker Wang Jin-pyng to issue a get-out deadline and call police on protesters who defy the order to be martyrs (pronounced “media celebs”) for a cause. Batons would bring blood, but hospitals are ready after the violent ouster March 23 of protesters from the cabinet headquarters. Whether it’s the crush of midterm exams this month, fatigue from sleeping on cardboard mats or frustration for lack of protest results, the students anchoring today’s occupation may find things more rewarding outside parliament. About 700 protesters are there at any one time, some at the podium and others in doorways. That’s down from thousands in the occupation’s first week and more than 100,000 street demonstrators for the same cause on Sunday. Protest leaders suddenly announce that (perhaps after exam season) they will move outside parliament to a venue that’s high profile but doesn’t obstruct government business.